Size: 5.5" x 3.1" x 1.5"
The Canon LE-100 was one of the few portable calculators using a precision and LED-display of 10-digits. It was introduced together with the LE-81M. From the technology the LE-100 is similar to the SR-10 introduced by Texas Instruments just a few months earlier but sports a TMS0125 single-chip calculator circuit instead the original TMS0120 chip. The remaining components of the featured LE-100 calculator were not manufactured by TI, the LED-modules are obviously from TI's competitor Bowmar while the display-drivers look like discrete cirucits encapsulated in small plastic blocks. The TMS0120 single-chip calculator circuit was derived from the TMS1802, better known as first "calculator-on-a-chip". Later - and cheaper - calculators in the LE-line were the LE-83, LE-84 and LE-85. Compare it with the Bowmar 901D. 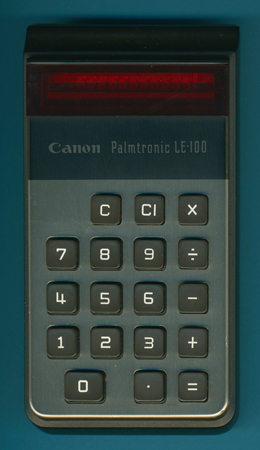 Later in 1974 Canon introduced with the LD-80 their first pocket calculator with the green VF-Display (Vacuum Fluorescent) and terminated the LE-series.